Hyderabad: Indian Institute of Technology Hyderabad held its first ‘Industry Day’ today, 12th January 2018, to encourage collaboration between industries and academia. As a part of 10th-year celebrations, Industry day offered an exciting avenue for IITH to exhibit their capabilities to industry. More than 40 industries participated in this event. Almost a decade has passed since the inception of the Institute. Over the past years, IIT Hyderabad has been consistently ranked as one of the top ten engineering and technology institutes in the country. Active industry interaction is part of the research culture at IIT-H resulting in more than 50 diverse industry partners and 10% of its Research & Development (R&D) budget from industries. Speaking about Industry Day, Prof. U. B. Desai, Director, IIT Hyderabad, said, “I am extremely happy and very thankful to the more than 40 industries that are participating in this event. I am very hopeful that this event will pave the way for enhanced industry-IITH joint research and development projects, some of the industries setting up their research labs in IITH Research Park, and industry funded masters and Ph.D. programs”. The Institute cherishes the close relationship with the industry. Hence, the aim of the Industry Day was to further strengthen the existing relationships and to forge new ones between various industry partners and the Institute. The theme of the interactive session was ‘Industry academia interaction’ and the objective of the session was to know about the research work and projects done by IIT Hyderabad as well as the Industries. In addition, what industry expects from academia is also emphasized. This provided a scope for closer research collaborations in the mutually agreed areas. Over 40 industries such as Microsoft, Adobe Research, TATA STEEL, Boeing, Qualcomm, Hindustan Unilever Ltd., Samsung Research India Ltd. etc. were part of the event. 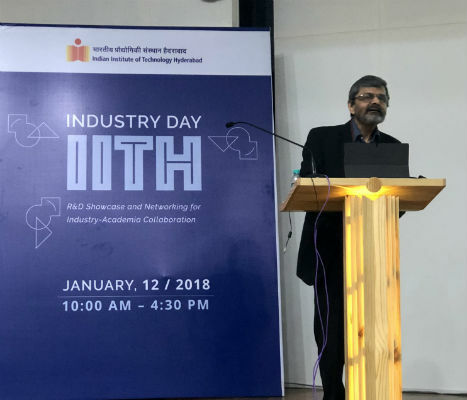 The Industry Day presented a unique opportunity for IITH faculty to interact with industries and for various organisations from the industry to establish long-term collaborations with IIT Hyderabad. The event offered a platform for the Industry and the Institute to exchange ideas, create synergies, and plan the path to mutual success.